The question was: Do you judge a book by its cover? My answer: a clear yes and no. Yes: When I go book-browsing, I judge a book by its cover. That and its title are the only two things you've got to go by when browsing unknown books, and I absolutely base my desire to pick it up and read the back blurb on whether or not the cover appeals to me. Sometimes an intriguing title can make me move past a lousy cover, but that doesn't happen terribly often, and I actually can't think of any specific examples right now. No: When I have books recommended to me, I don't stay away from reading them, just because I don't like the cover. And if I have one edition of a book, I don't go out and buy another, just because I discover I prefer that cover. 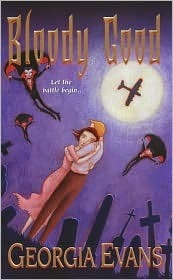 Some of my favourite books have absolutely hideous covers. 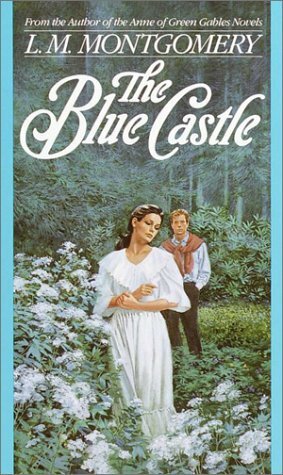 Cases in point, the below editions of The Blue Castle by L.M. 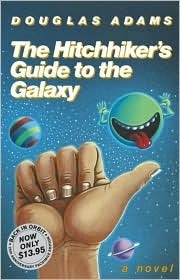 Montgomery and Hitchhiker's Guide to the Galaxy by Douglas Adams. In both these cases I'm able to disregard the extremely ugly covers because I know and love the books so much. And although I did write above that I judge a book by its cover when I'm browsing books, and probably pass over what may be terrific books because the cover don't catch my eye, neither do I buy books just because of the cover. An intriguing cover isn't enough. It has to be combined with an interesting-sounding back blurb. So I don't judge books that much.